Size: Up to 3 feet and almost 4 or 5 feet wide. Growth Form: Shrub, subshrub; plants shrubby, stems decumbent. Leaves: Grayish-green; decumbent; leaves pilose or villous above (adaxial); leaves often fascicled; leaves in clusters at nodes, leaf shape variable from linear to oblanceolate, rolled under (revolute), bottom (abaxial) of leaves white-tomentose. 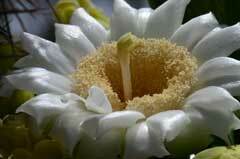 Flower Color: White, pink; flowers slightly fragrant, flowers in flat-toped clusters (terminally); inflorescence cymemose; canescent, perianth with stalk-like base; fruit glabrous. Elevation: 1,00 to 4,500 feet. Habitat Preferences: Dry rocky slopes, canyons in scrub communities and washes. 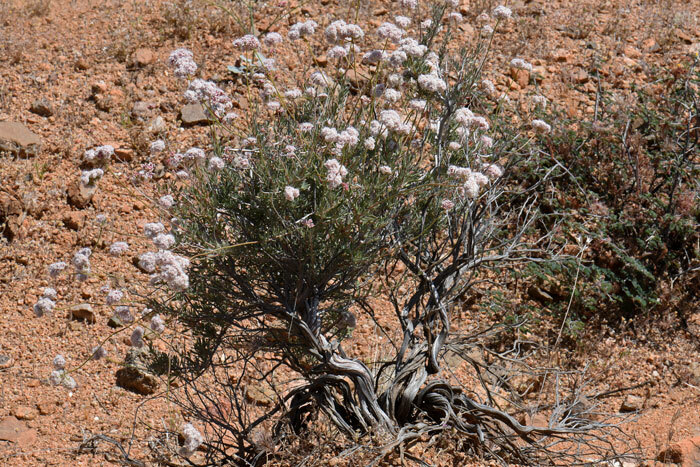 Recorded Range: Eriogonum fasciculatum is found in the southwestern United States in CA, AZ, NV, UT. It also has large populations in Baja California and northwest Mexico. In Arizona it occurs throughout the western ½ of the state and in Graham county. North America & US County Distribution Map for Eriogonum fasciculatum. 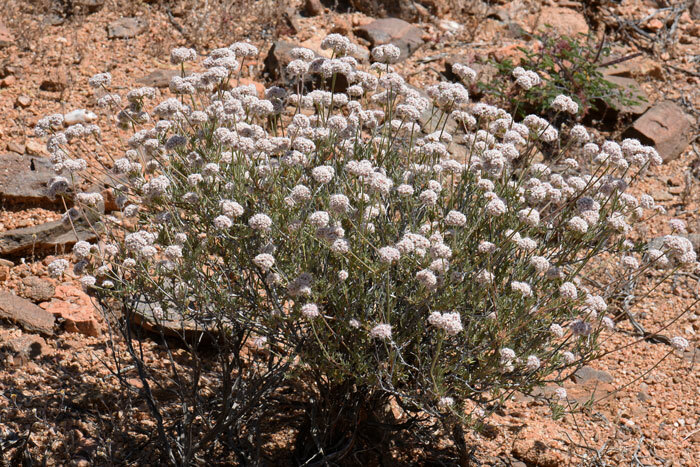 Eriogonum fasciculatum var. polifolium, Eastern Mojave Buckwheat (AZ, CA, NV, UT). Comments: Flat-top Buckwheat is one of the more dominant low- and high-desert species primarily in the Sonoran Desert. 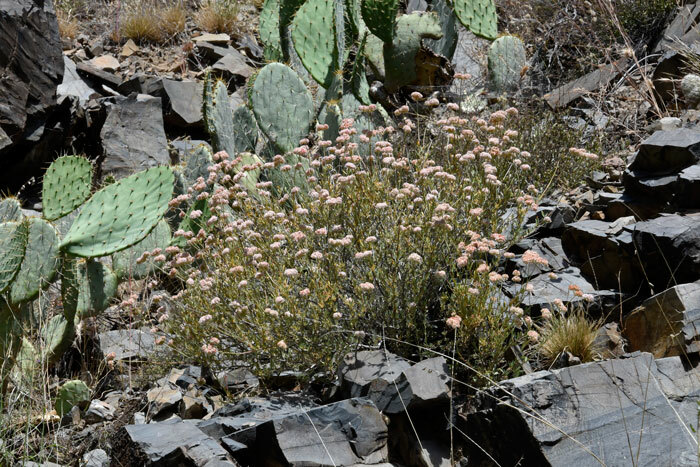 However, "foliolosum" and "polifolium" are prevalent in both the Mojave and Sonoran Deserts (Both of these varieties are found in Arizona). All forms are quite variable in appearance. Various species of Eriogonum play host to the larvae (caterpillar) of several butterflies including the Mormon Metalmark butterfly (Apodemia mormo), the Rocky Mountain dotted-blue (Euphilotes ancilla) and the Lupine Blue (Aricia lupini). 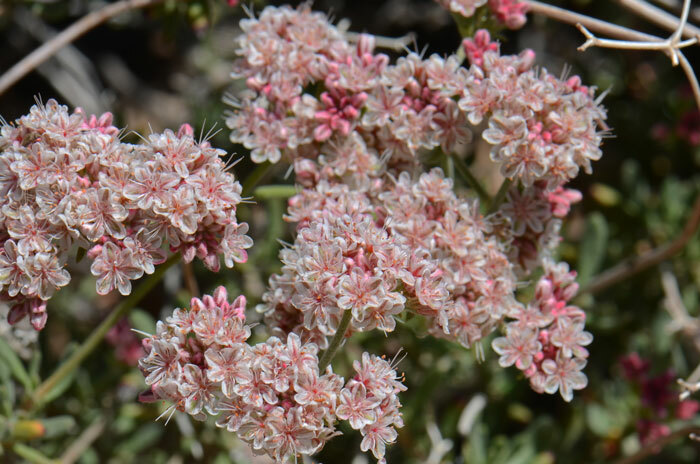 In Southwest Desert Flora also see Abert's Buckwheat, Eriogonum abertianum, Skeleton Weed, Eriogonum deflexum, Desert Trumpet, Eriogonum inflatum, Little Deserttrumpet, Eriogonum trichopes, Sulphur-flower Buckwheat, Eriogonum umbellatum and Wright Buckwheat, Eriogonum wrightii. Zuni Drug, Dermatological Aid; Poultice of powdered root applied to cuts and arrow or bullet wounds. Craig C. Freeman, James L. Reveal, FNA, | Family List | FNA Vol. 5 | Polygonaceae | Eriogonum 80. 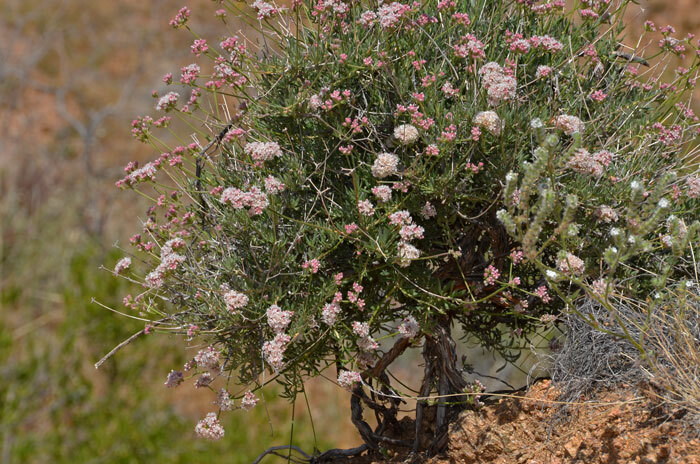 Eriogonum fasciculatum Bentham, Trans. Linn. Soc. London. 17: 411. 1836. Flora of North America Editorial Committee, eds. 1993+. Flora of North America North of Mexico. 16+ vols. New York and Oxford. Native Plant Information Network, NPIN (2013). Published on the Internet http://www.wildflower.org/plants/ [accessed: 06/03/2016]. Lady Bird Johnson Wildflower Center at The University of Texas, Austin, TX.